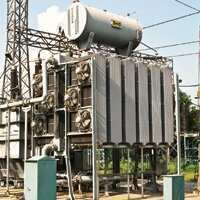 Heavy duty: A power transmission unit on the outskirts of Muzaffarnagar, Uttar Pradesh. China has four power generation equipment manufacturers compared with India’s lone manufacturer, Bhel. In a move that could help India address the problem of shortages in power equipment, which are now causing severe bottlenecks for generating more power, the power ministry is supporting giving a tax exemption to overseas companies that have evinced interest in manufacturing power generation equipment here. “We will very strongly argue their case with the finance ministry," said a senior power ministry official, who did not wish to be identified. “Several players including Mitsubishi Heavy Industries (MHI), Toshiba Corp., Hitachi,Dosan, Siemens, Alstom, LMZ (Russia), Technoprom (Russia) and Dongfang have been asking us for zero duty asset import for quite some time." These global power equipment manufacturing companies have been lobbying the government to allow them duty-free import of machinery needed for setting up their manufacturing facilities, as reported by Mint on 5 April. These proposed facilities are to manufacture equipment with super critical technology capacities—660MW and 800MW. At present, the public sector Bharat Heavy Electricals Ltd (Bhel) is India’s only manufacturer of turbines of comparable capacity. The move comes at a time when the Union government is concerned about the Indian manufacturing giant’s ability to supply equipment that can help meet soaring power generation requirements as well as India’s ambitious target of adding around 78,577MW of power in the next five years. Based on current evaluations, India is set to miss the target, in part because of equipment shortage, as reported by Mint on 28 ­August. India allows 100% foreign direct investment in the power sector. Power equipment manufacturing companies already benefit from zero import duty on inputs—which means they do not have to pay any duties on components that go into the manufacture of finished goods. Now, this benefit may be extended to the import of machinery for setting up the infrastructure. However, most of these proposed new facilities are likely to become operational only after 2012, as it takes at least four years to set up power equipment manufacturing facility. The Central Electricity Authority, the apex power sector planning body in the country, has been holding meetings with these overseas manufacturers to help them set up greenfield projects in the country. “They may set up these facilities in a joint venture with an Indian firm. It is for them to identify a partner," a senior authority official, who did not wish to be identified, said. Industry experts say India needs competition in the power equipment manufacturing sector as it will lower costs and help power project developers get better rates from equipment suppliers. Compared with India, which at present has only one power-generation equipment manufacturer in Bhel, China has four companies. Analysts say this is the reason for China adding five times the power generation capacity that India is adding annually. “Such facilities are required. The issue is whether they can still be competitive in an Indian scenario. That is the challenge. One needs to book capacities upfront to break even," according to Shubhranshu Patnaik, an executive director at consultant PricewaterhouseCoopers. India has a power generation capacity of 1,35,006MW today which is not sufficient for the second fastest growing major economy in the world. Power shortages have been identified as a key infrastructure ­bottleneck. In the 10th Plan period (2002-07), only 20,950MW of generating capacity has been added against a target of 41,110MW.